Dimensions: 3-1/2 x 5-1/8 x 3/4 in. 41 playing cards in drawer box, 1 instruction card, full-color images throughout, for ages 5 and up. 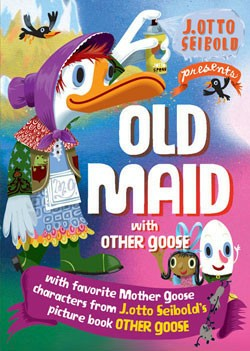 It's the classic game of Old Maid featuring all the favorite Mother Goose characters from J.otto Seibold's Other Goose. Humpty Dumpty, Jack Be Nimble, Little Bo Peep, Miss Muffet, and Little Boy Blue all appear on 41 eye-popping illustrated cards. Parents and children will adore this card game based on an old and new classic!